This artist's impression shows the dust torus around a super-massive black hole. Black holes lurk at the centers of active galaxies. The jets emanating from the black hole send neutrinos hurtling into space. Scientists for the first time have been able to pinpoint the source of an extremely powerful version of a neutrino, a ghostly particle that can travel virtually unimpeded through space. It's an achievement that opens a whole new way of looking at the universe. The neutrino was detected by a South Pole observatory called IceCube that was specifically designed to catch the particles. It consists of a cubic kilometer of ice festooned with more than 5,000 detectors. Neutrinos don't interact with much, but occasionally one will strike another particle, giving off a kind of light known as Cherenkov radiation that IceCube's detectors can pick up. When a particularly high-energy neutrino is captured, IceCube sends out an alert. "We had this neutrino alert in September 2017," says Olga Botner, a particle physicist at Uppsala University in Sweden and a member of the National Science Foundation-funded IceCube scientific team. On Sept. 22, to be precise. When the alert went out, a bevy of observatories on Earth and in space started searching the portion of the sky where the neutrino appeared to be coming from, looking for something that might have generated it. There had been other alerts prior to last September, but past searches failed to turn up a viable candidate. This time, as Botner and her colleagues report in the journal Science, two observatories, NASA's Fermi Gamma-ray Space Telescope and the Major Atmospheric Gamma Imaging Cherenkov telescope, saw a burst of gamma energy coming from the same location as the neutrino. Gamma rays are the kind of radiation one would expect to see from an object generating neutrinos. The object, known colloquially as TXS 0506+056, was something called a blazar approximately 4 billion light-years from Earth. 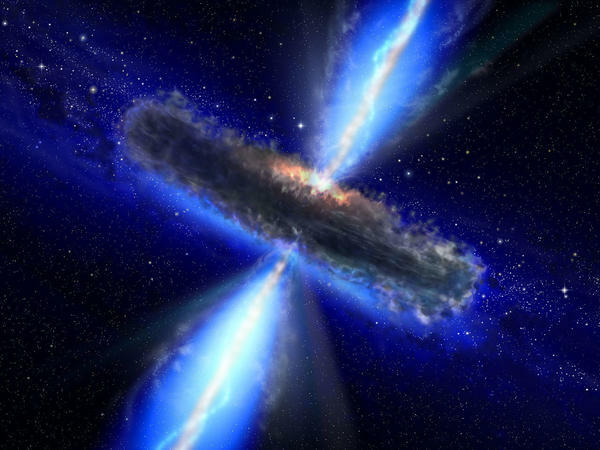 "Blazars are very special objects," Botner says. "They are intensely bright galaxies harboring a black hole at the center." To confirm that TXS 0506+056 was indeed the source of the single energetic neutrino detected in September, Botner and her colleagues went back through nearly a decade of data IceCube had collected. They found that other energetic neutrinos had been detected from the same location but had not been previously associated with a celestial object. Those results appear in a second Science paper. The neutrinos are expelled in jets that shoot out energetic particles from the black hole spinning inside the blazars. "Those jets are a very interesting subject for astrophysicists," says astrophysicist Ke Fang, a JSI Prize postdoc fellow working at the University of Maryland and NASA Goddard Space Flight Center. "Because these are direct outputs from those black holes." Fang says the hope is that more of these neutrinos will be detected, which should give physicists more information about the physics that govern black holes. In fact, studying neutrinos given off by celestial objects will give scientists more information about cataclysmic events such as exploding stars and colliding neutron stars. "Astronomy started when people looked at the night sky, and that's light hitting your eyes," says Naoko Kurahashi Neilson, an astrophysicist at Drexel University in Philadelphia and another member of the IceCube collaboration. "It's expanded from just visible light to X-rays and gamma rays, and also to infrared and radio waves," she says. But light waves and gamma rays and even radio waves are all what scientists call electromagnetic radiation. They differ in wave length, but they're all from the same family. "And then here come neutrinos," Neilson says, "which is a completely different way to look at the universe. And gee, I wonder what we can see if we use this whole different way to look at the universe." Of course, scientists don't know what they'll find, but then that's the whole point, isn't it? Scientists announced today that for the first time, they have been able to pinpoint the source of a particle called a high-energy neutrino. It was detected by an observatory at the South Pole. And as NPR science correspondent Joe Palca reports, finding the source of this particle opens a whole new way of looking at the universe. JOE PALCA, BYLINE: At the South Pole, there's a sophisticated observatory designed to catch high-energy neutrinos, enigmatic particles produced by violent cosmic events like exploding stars. Neutrinos are sometimes called the ghost particle because they can travel virtually unimpeded across the universe. When a particularly powerful neutrino is captured, IceCube sends out an alert. OLGA BOTNER: We had this neutrino alert in September 2017. PALCA: Olga Botner is a particle physicist at Uppsala University in Sweden. I reached her via Skype. When the alert went out, a bevy of observatories on Earth and in space started searching the portion of the sky where the neutrino appeared to be coming from, looking for something that might have generated it. There had been other alerts, but each time, the search turned up empty. This time, as they report in the journal Science, telescopes saw a burst of energy coming from an object 4 billion light years from Earth called a blazar. BOTNER: Blazars are very special objects. They are intensely bright galaxies harboring a black hole at the center. PALCA: Botner says the black holes are spinning, and jets of energetic particles shoot out from the top and bottom, traveling at close to the speed of light. BOTNER: And the nice thing about blazars is that one of these jets is pointing directly towards Earth. PALCA: So 4 billion years ago, a jet from this blazar sent a neutrino zooming toward Earth, and that neutrino was captured at the South Pole last September. PALCA: Ke Fang is an astrophysicist at the University of Maryland. FANG: ...Because these are direct outputs from those black holes. PALCA: Fang says the hope is more of these neutrinos will be detected, and that should give physicists more information about the physics that govern how black holes behave. In fact, now that they know it's possible, studying neutrinos given off by celestial objects opens a whole new way of looking at the universe. NAOKO KURAHASHI NEILSON: Astronomy started when people looked at the night sky, and that's light hitting your eyes. PALCA: Naoko Kurahashi Neilson is an astrophysicist at Drexel University in Philadelphia. NEILSON: It's expanded from just visible light to X-rays and gamma rays and also to infrared and radio waves. PALCA: But light waves and gamma rays and even radio waves are all what scientists call electromagnetic radiation. They differ in wavelength, but they're all from the same family. NEILSON: And then here comes neutrinos, which is a completely different way to look at the universe. And, gee, I wonder what we can see if we use this whole different way to look at the universe. PALCA: Of course scientists don't know what they'll find, but then that's the whole point, isn't it? Joe Palca, NPR News. Transcript provided by NPR, Copyright NPR.